Pvt. Robert Stewart aided Pfc. Brandon Cobb, who was "injured" yesterday during a checkpoint exercise at Medina Jabal. FORT IRWIN, Calif. » The harsh realities of the war in Iraq -- suicide bombers, roadside explosions, insurgent attacks -- are slowly sinking in for 5,000 Schofield Barracks soldiers as they finish their last major combat training mission this month. The 25th Infantry Division soldiers, who will be deployed to Iraq beginning in July, are training in this Mojave Desert location that the Army has set up to replicate a wartime deployment in Iraq -- the heat, the pressure, the dust, the sand and even the fatigue. In yesterday's exercise, nine members of Charlie Company, 2nd Battalion, 27th Infantry (Wolfhounds), were "killed" and six "wounded" when a suicide bomber driving a truck carrying four 155 mm artillery shells ran a checkpoint at the mock Iraqi village of Medina Jabal. Five miles west of Medina Jabal, in the rural village of Medina Wasal, soldiers assigned to the 3rd Battalion, 7th Field Artillery, suffered six "casualties" when they were attacked by insurgents. Although the combat losses were not real, the Schofield Barracks soldiers learned lessons that could save their lives in Iraq later this year. "If a soldier dies here, he gets to come back. It doesn't happen like that in Iraq," said Capt. Chris Magauero, who heads the team of observer/controllers helping to train the soldiers. The 3rd Brigade arrived here three weeks ago, spent a week in the barracks area replicating a staging point like Kuwait. At the end of the week, they drove by convoy into what is called the "box" -- a training area the size of Rhode Island. For the past two weeks, the Army has tried to make the living conditions here at the National Training Center as realistic as possible using 1,600 soldiers and civilians, including 250 Iraqi nationals, in different rolls. Separated by a few miles, the two villages of Medina Jabal and Medina Wasal offer Col. Patrick Stackpole, 3rd Brigade commander, a range of problems he will face this summer. Medina Jabal, the largest village of 12 inhabited by the 3rd Brigade soldiers, is considered friendly to U.S. troops. The Wolfhounds were able to house about 120 soldiers from Charlie Company in the village. Tropic Lightning soldiers walk freely through the complex where 160 Iraqis live. At Medina Wasal, it's a different picture. When the soldiers of the 3/7th tried to retake Medina Wasal in the opening days of the war games, they failed. Insurgents live freely in Medina Wasal, striking whenever they can, including yesterday on a group of Tropic Lightning soldiers stationed outside of the village. Earlier, the insurgents bombed the village's police chief even though he was Sunni. Lt. Col. Jim Miller, who is part of the team of observer/controllers, said Army units arrive at the National Training Center at different degrees of proficiency. "It's up to the commander to tell us what area he wants to emphasize. We have to ... make sure that no matter what level you come here with, that when you leave you are ready for combat. 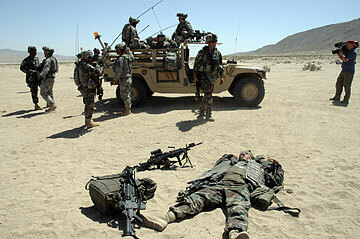 In role-playing exercises yesterday, Army Pfc. 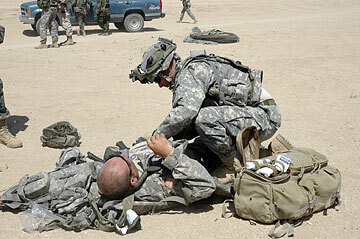 Jacob Weaver was "injured" by a truck driven by an insurgent who tried to run a checkpoint at the mock Iraqi village of Medina Jabal at the Army's National Training Center in Fort Irwin, Calif.
"That is why the Army likes to refer this training as a graduate-level course." At the Medina Jabal suicide bombing, observer/controller Sgt. 1st Class Mark Meija said the procedures used by Charlie Company were almost correct. "They have to learn from their mistakes," said Meija. "Their other choices were to fire warning shots or just shoot at the vehicle." But, he added, at times "there is almost nothing you can do," noting that the kill radius of four 155 mm artillery rounds is "immense." Over the past two weeks, Army trainers have exposed 3rd Brigade soldiers to more than 100 scenarios of home-made, suicide or roadside bombs. In Medina Wasal, Pvt. Michael Jefferson, a member of Alpha Battery, said as he surveyed the aftermath of the brief insurgency attack: "What we are going through now will help us to face what we are going to face in Iraq." The 3rd Brigade will spend next week cleaning up their equipment and reviewing what occurred over the past two weeks before returning to Schofield. Miller said the leaders of the 3rd Brigade will be able to leave here with areas they may want to improve on. "Basically, they will know what happened here, why it happened, and how they can do better the next time," Miller said. "And there is going to be a next time and it will be in Iraq." Star-Bulletin reporter Gregg Kakesako is on assignment in Fort Irwin, Calif., where 5,000 troops from Hawaii's 25th Infantry Division are training before July deployment to Iraq.